Mr. Larry Stephens, 55, of Cartersville died suddenly, Thursday, April 3, 2014 at Cartersville Medical Center. Born in Atlanta, Ga. on January 13, 1959, he was the son of the late Jonas Dillard Scruggs and the late Betty Ann Lee Scruggs. arry was employed by National Steel City Local 515 and enjoyed fishing, hunting and going to the ocean. He was a generous, fun loving person and donated his organs in order to help someone. Larry donated time to the Etowah Valley Humane Society because of his passion for animals. 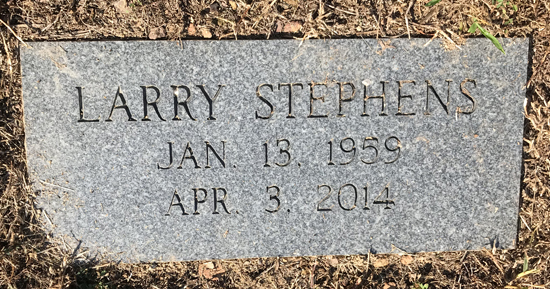 In addition to his parents, he is preceded in death by his brother, Gene Stephens. Survivors include his sister, Kimberly Scruggs and her wife, Tina of Cartersville; his cousin, Barry Scruggs of Buchanan; and his best friend, Paige Bailey of Dunwoody..